How Long Does Pie Last? How long does pie last? The shelf life of pie depends on a variety of factors, such as the sell by date, the preparation method and how it was stored. Just about anything made in a deep circular tin with a crust and a filling is called a pie. Different types can be enjoyed for breakfast, lunch, dinner or dessert. The majority of pies are still baked within a flour based crust and filled with some sort of fruit. But there are more and more untraditional pies being baked (or not) every day. Quiche is actually an egg pie and even pizza is called a pie. Crusts are being made from graham crackers, crushed cookies like Oreos and all sorts of other ingredients. Of course, all foods last for a shorter period of time if they are not stored properly. But remember, like a lot of other sweets, they usually have a sell by date or a best by date and not a use by date or an expiration date. Because of this distinction, you may safely use foods even after the printed date has lapsed for varying times. Freezing is an indefinite storage spot, but foods don't freeze forever and should not be re-frozen once thawed. How to tell if Pie is bad, rotten or spoiled? Although not a perfect test, your senses are usually the most reliable instruments to tell if your Pie has gone bad. The first thing to go bad with the pie is usually the crust because the filling will begin to loose water and the crust will absorb that water and become soggy. How to store Pie to extend its shelf life? You can help keep pie fresh by keeping it in the refrigerator as much as possible. Un-cut fruit pies can remain on the counter for about 2 days. Once prepared, pie should be stored in a tightly closed container or wrapped with plastic wrap to keep out air and other contaminants. Once cut, all types of pies should be wrapped and refrigerated. For a long-term option, you can freeze your pie while preserving its taste if you use an air-tight freezer safe container. 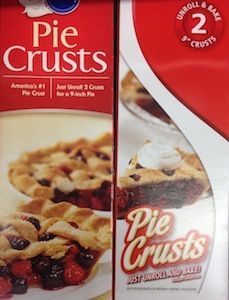 Pie crusts and Puff Pastry should be kept in the same form in which it was purchased. Puff Pastry is made to be used just out of the freezer an pie crusts can be handled most any way. To make a super easy crust see our simple crust recipe. And, if you like Kailua, try our flavorful Kahlua cream cheese pie. How long is Pie good for when prepared in a dish? How long does pie last? That depends. How long do eggs last? In general, pie lasts only as long as the quickest expiring ingredient in the dish. In determining how long Pie lasts, our content incorporates research from multiple resources, including the United States Department of Agriculture and the United States Food & Drug Administration. In addition, we scoured the web for informative articles and reports related to food safety, food storage and the shelf life of Pie. Although the Pie shelf life information on Eat By Date is generally reliable, please remember that individual cases will vary and that our advice should only be taken as an opinion and not a replacement for your health care professional. Please eat responsibly!